ClienTrax is your complete Technology Solutions Provider. ClienTrax offers high-quality digital imaging solutions and complete seamless integration with your practice management system. Digital technology not only improves the quality of your radiographs – it improves patient care through increased speed, efficiency, and productivity. And that’s good for you and your bottom line. We are proud to provide you with the latest digital imaging technology through partnerships with industry leaders in Computed Radiography (CR), Direct Digital Radiography (DR), and Digital Dental Sensors. Watch below to see how ClienTrax True Integration improves your workflow. Exclusive and unique feature of having a jpeg thumbnail image displayed within the patient’s medical record. ClienTrax PACS lets you maximize the productivity of your digital imaging system. We help improve how you view, manage, share, store, retrieve, distribute and reproduce the images created in your devices. 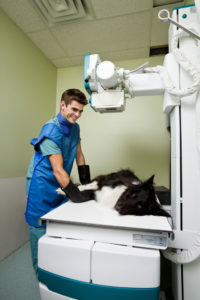 ClienTrax PACS allows for complete and seamless integration to the patient medical record to all modalities used in veterinary medicine today, including Digital Radiography, Digital Dental Radiography, and Ultrasound. ClienTrax Business Continuance – immediate access to data after system failure, are available for a small monthly fee.